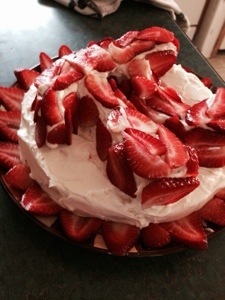 A wife's journey through motherhood, pregnancy loss, homeschooling, baking, and more. 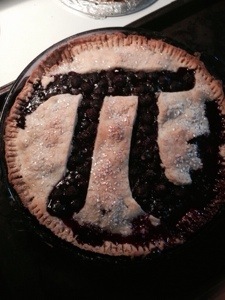 Last night I knew I was going to bake a blueberry pie for Pi Day (3.1415…). I brought it up to GamerDad and he said he would prefer a cake. I’m doing both. 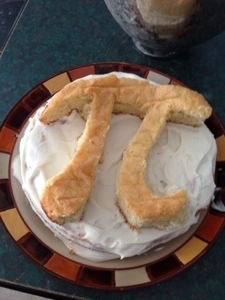 At first I wanted to do Pi 3D. Once I printed out the template, I thought it would be crazy flimsy to try and do a two-layer cake. Thanks to a friend, I modified the idea and stuck with a 9on round on the bottom. She suggested just the rounds and making Pi out of fruit. 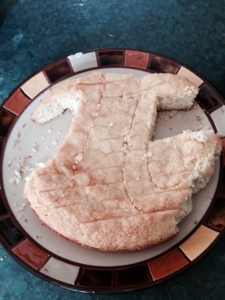 Well, I cut out Pi from the second cake while front carrying Lil Miss in our Ergo carrier. Not an easy task. The top photo is what I am dubbing “cake surgery.” The bottom is the successful transfer of Pi onto the round. I used two spatulas and a lot of slow determination. The frosting is a simple cream cheese frosting: 1 brick of cream cheese, 1 stick of butter, a pour of vanilla, and about 3 cups of sifted powdered sugar. The first two ingredients I beat the heck out of. The sifting is the key to any frosting with powdered sugar unless you dig the lumpy look. 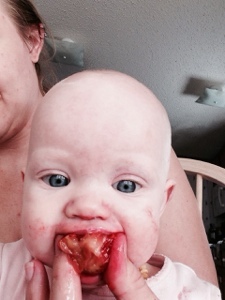 Next, I took Lil Miss’ favorite food (I know, I know BLW at 1 year, but she seriously screams for these), strawberries, and sliced them. Tada! 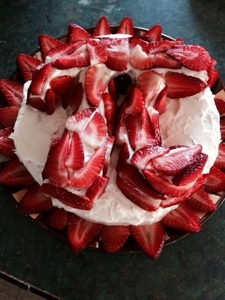 Mosaic strawberry Pi! 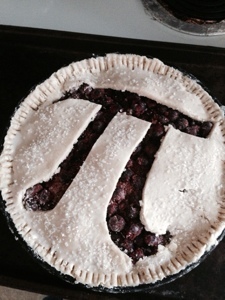 *Edit* For those who have been waiting, Pi Pie! It is blueberry and smells delish! It exploded a bit, which is why I included the pre-baked photo.